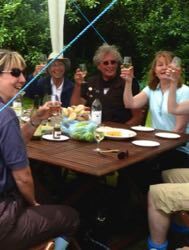 Our leisurely Summer tours and tastings start again at Easter 2019. Until then we are open for sales when we are here, which is most of the time, 11am-5.30pm. Come and see where the wine comes from and get the best prices! Taste before you buy. You can buy our wines at the vineyard by the case, 6-pack, presentation 3-pack or bottle. Our wines are single-vineyard still, dry whites. Case prices are on our Shop page. Bottle prices at the vineyard are £12.50 - £18, with reductions if you buy 3 or 6. We take credit cards and Contactless as well as cash and cheques. We sell only our own crisp, dry white wines, made from grapes grown here. Details of our current releases here>> . This is a very peaceful, uncommercial spot. No shop, just our cellar door and a tent to taste under in front of the farmhouse and next to the vineyard. There is a narrow access lane, arched over with trees at the end, that ends in front of the house. Plenty of space to park and turn once you get here. Best to ring (01278 671340) or e-mail first to check we'll be here when you come. Regular opening, tours and tastings will start again on Good Friday 2019. We'll be open for free tasting and walking the vines with us on Fridays, Saturdays and all over Bank Holiday weekends until early September. Outside these times by appointment. The vineyard is at its best from May to early Sept. Before May the vines are dormant, though you can learn about winter pruning work which will be in progress until mid April. Our outdoor, tented tasting area in front of the farmhouse is a peaceful spot to relax and explore the wines. We enjoy introducing our vintages and showing you the vineyard, explaining how we work our venerable, 25 year old vines. Children (accompanied) are welcome. We are dog-friendly. Dogs (under control) are welcome in the vineyard and you can walk with them around the nature area beyond. We also welcome riders and cyclists. If you want to buy wine and are walking, cycling or riding, we can deliver locally for you after your visit. 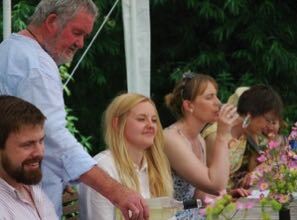 We do not serve food but you are welcome to bring a picnic, we just ask that you buy some Oatley wine to go with it! 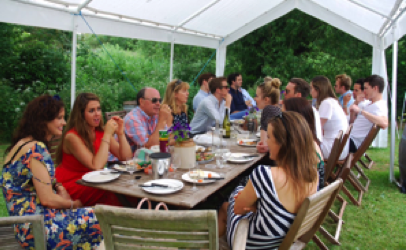 For groups of more than 6 we ask for a contribution of £10 per person, which covers a full tasting of our current releases (normally 4 x 50ml tastings), talk and tour of the vineyard guided in person by Iain or Jane. A group visit normally lasts one and a half to two hours. You can buy our tour and tasting gift vouchers online. They cover a tour and full tutored tasting, personally-conducted by Iain or Jane, and include 3 bottles for your recipient(s) to choose and take home with them. These vouchers make memorable gifts (see what visitors have said in our Tripadvisor and Facebook reviews, links on the left). We email the voucher to you so it’s a good last-minute solution. 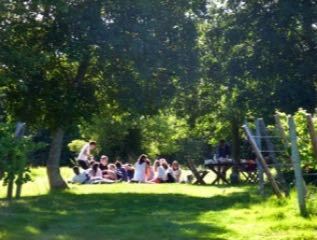 Tasting and tour last about one and a half hours and visitors are welcome to bring a picnic to enjoy afterwards. For tours and tastings please wear sensible footwear for mown, but still roughish, grass, and bear in mind that our tasting area is outdoors under a tent so you’ll need a jacket if the weather’s cold. If the weather is really bad you can taste the wines in the farmhouse - we can usually rustle up a log fire. The approach to Oatley is down a single-track narrow sunken country lane, with a corner not passable for coaches, and we don't have facilities for coach parties, but we love to see you in smaller groups when we can give you the welcome we would wish. Fancy following a vineyard trail? A map of trading vineyards is produced by the SW Vineyards Association here>> Or for a national, sortable directory and map, try the Wine Cellar Door website>> and app.